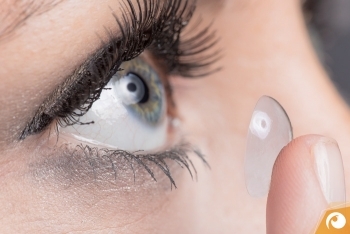 Modern contact lenses are more comfortable to wear than ever before. New materials and lens geometries make it easy to get used to lenses and enjoy good vision without glasses – even for individuals who have never before worn contact lenses. Fundamentally speaking, a professional fitting of contact lenses is essential to ensuring the health of your eyes. Wearing lenses that are incorrectly – or not at all – fitted can lead to irreversible eye damage, as can the improper handling of contact lenses. Contact lenses are characterized by a great number of different physical properties including the material used and its oxygen permeability and equilibrium water content as well as, not least, their form. These factors will sustainably influence their wearing comfort and the vision quality they offer. But at least equally important is choosing the right cleaning solution and properly handling your contact lenses. For this reason, after a comprehensive consultation, our experienced contact lens fitter will ascertain the optimal type of contact lens for your eyes and provide comprehensive instructions on the proper handling and care of your new contact lenses. Schedule an appointment for a professional contact lens fitting by phone, per e-mail or with our online form. Enjoy the feeling of freedom!